Those who look to the skies on Friday (Aug. 5) may see exceptional auroras thanks to a strong solar flare that hurled a cloud of plasma toward Earth earlier this week. 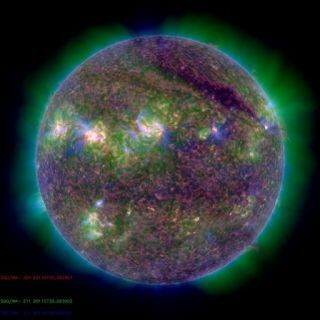 The solar flare occurred yesterday (Aug. 2) when an intense magnetic event above sunspot 1261 blasted out a flow of charged particles that's now headed toward Earth, according to SpaceWeather.com, a website that monitors space weather. This could unleash a geomagnetic storm here on our planet that might disrupt satellite and radio communications. The plus side, though, is that skywatchers at high latitudes can expect extra-special aurora borealis displays, also known as the Northern Lights, from the interaction of these charged particles with Earth's magnetic field. Yesterday's solar storm unleashed a stream of protons and electrons into space in an eruption known as a coronal mass ejection (CME). It is this flow of particles that is now on a collision course with Earth. Three NASA spacecraft — the SOHO satellite and the twin STEREO vehicles — were able to track the ejection as it left the sun. Their three different vantage points provided a 3-D model of the cloud that revealed it left the solar surface at a rate of about 560 miles per second (900 kilometers per second), SpaceWeather.com reported. Editor's Note: If you snap a photo of the supercharged aurora this week and would like to share it with SPACE.com, please send to managing editor Tariq Malik at tmalik@space.com. Thanks!